Constructed of soft flexible vinyl, this tag is a seamless pouch – open at one end. Imprinting text and/or logos is done in single or multiple colors. It is very durable and ideally suited for use where exposure to weather elements is a concern. 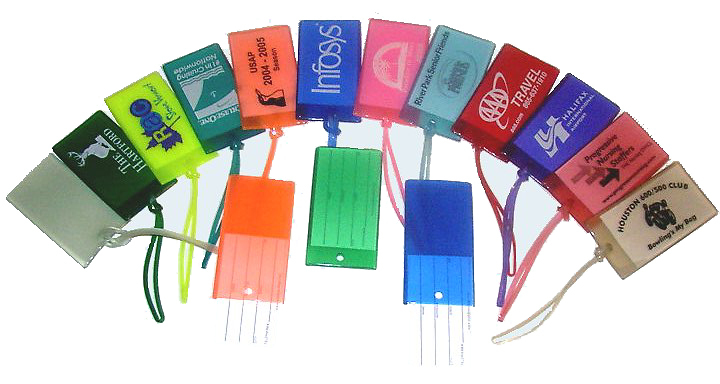 A standard business card or ID card is inserted into the pouch and is locked in place by a color matching loop which facilitates easy attachment to a suitcase or bag. The availability of this tag in many bright colors makes it great for group travel where easy luggage identification is necessary.